The technology behind Artificial Intelligence is empowered with mammoth power that can transform the world we are living in. With this technology, we are ready to take a leap towards a secure future. However, experts are surrounded with certain speculations related to Artificial Intelligence and its future. Until now, the discussion was limited to AI replacing humanity, our jobs and creativity in coming future. But now, several international organizations and governments are worried about AI turning into a lethal autonomous weapon and the possibility of falling into the hands of terrorist organizations. Talking about dangers of AI, do we know what are the moral and legal consequences of autonomous weapons based on AI technology? Are we prepared enough to deal with this incoming danger especially when autonomous weapons are already in the Warfield? None of these questions have an easy answer. Technology is a great slave but a bad master!! With the help of Artificial Intelligence, several sectors of the economy have experienced progressions from healthcare to transportation and entertainment. In fact, the scope of this technology is yet to be discovered but transferring complete command from human to machines in case of weaponized machines is a matter of risk. Meanwhile, the concept of “killer Robots” have been brought to reality and organizations like United Nations want to put complete ban on such developments. Influential leaders like Elon Musk of Tesla and Mustafa Suleyman of Alphabet have warned about third revolution, if AI based robots are put into action. Read Also : Is Artificial Intelligence Eating The Need Of Software Developers? Meanwhile, countries around the world are justifying this development by considering it as an arm of humanity that can benefit the world in future. But what if the same technology falls into wrong hands and terrorists use them for mass destruction. What if a simple glitch in a weapon can take lives of millions? 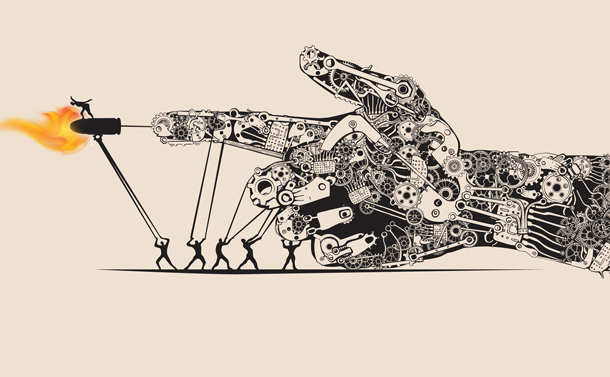 What if robots surpass human intelligence and start a world war against human? Will we be able to survive in such a scenario? For instance, recently, the US government and Chinese military have tested “Swarming Drones”. They are unmanned aircrafts that can be sent to the target in large number and cause mass killings. As per the existing trend, there is no technology that is beyond the reach of terrorist organizations. Likewise, the possibility of replicating this drone is not going to be impossible. This may start a third world war, which in all probability will end humanity from earth. Recently, Facebook announced that it is using AI technology to eradicate content that supports any form of terrorism. Also, the same platform is using image-matching technology to recognize and prevent images and videos coming from a known terrorist that are popping up in other accounts. Meanwhile, they are working on Machine-Learning algorithm to understand the pattern of terrorist propaganda, so Facebook could easily and swiftly eradicate such content from the newsfeeds before it reaches to anyone. This is the other side of AI spectrum, where Artificial Intelligence will benefit humanity. In fact, Facebook is planning to extend this technology to its associated platform like Instagram and WhatsApp along with other tech giants like Microsoft, Twitter and YouTube. This will develop a database containing information about the digital fingerprints of terrorist organizations. As far as the future of Artificial Intelligence is concerned, it is ready to take over the world. But the use and misuse of this technology is entirely dependent on the moral and legal decisions of human. Till date, the root cause of every war was greed and supremacy and it was human, who triggered wars, genocides and massacres. They used technology to take over the world and now, they are worried about machines taking over them. As the future remains a mystery, is it ok to blame machines from now for future wars? Do we need to train and control machines or rather ask humans to remember humanity? Can machine really surpass human intelligence? These questions are not easy to answer and all we can do is to progress towards future while keeping this technology off from terrorists.